You may have seen recent headlines about a strange radio signal picked up by a Canadian telescope. Some go as far as to say it was caused by all-caps ALIENS. It probably wasn’t from aliens, as far as we can tell—nor are these “fast radio bursts” something you should be worried about. The truth is, the FRB spotted by Canada’s CHIME radio telescope on 25 July wasn’t much different from other FRBs that telescopes have spotted. But it’s still pretty cool and the first of its kind, so let’s talk about why. It’s true that FRBs are a cosmic mystery. First detected in 2001 but not reported until 2007, only around 50 of these events have been spotted by radio telescopes. They are quite literally fast radio bursts, bright-and-quick signals in the radio band, the longest wavelength and lowest-frequency electromagnetic radiation, beyond infrared and microwaves on the electromagnetic spectrum. Astronomers don’t know what causes these bursts, but they might be surprisingly common. Top FRB candidates include neutron stars with strong magnetic fields, called magnetars. Some physicists have suggested dark matter or extraterrestrial intelligence. Perhaps there are several different sources. Scientists are still trying to figure it out. 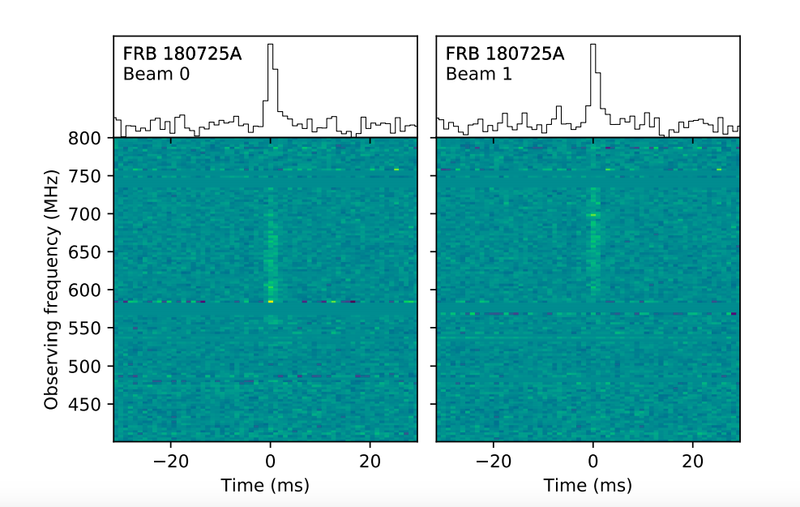 This hyped-up burst, called FRB 180725A, arrived at the Canadian Hydrogen Intensity Mapping Experiment (CHIME), a large radio telescope in southern British Columbia, at around 7pm BST/11am Pacific time on 25 July. It lasted for approximately two milliseconds, and had a frequency as low as 580 MHz, according to its Astronomer’s Telegram entry. The FM radio band spans frequencies from 88 to 108 MHz, for comparison, while a microwave oven excites molecules using an electric field with an alternating 2,450 MHz frequency. What makes this FRB so weird? It’s probably not much different from the rest, said Petroff, but 580 MHz is the lowest-frequency FRB scientists have spotted so far. Usually, these blips hit Earth with frequencies between 1,000 and 1,500 MHz. But it probably won’t be the last such blip. CHIME caught the signal during its commissioning phase, meaning the telescope is still getting up and running. FRB 180725A is just a taste of what’s to come. CHIME’s enormous field of view could allow it to find one FRB per day. “So the main exciting thing about CHIME is that it will probably find lots of FRBs, meaning more chances to learn where they’re coming from,” said Petroff. Is it exciting? Most certainly. Is it aliens? Probably not. It’s just another piece on the fast radio burst puzzle. In order to truly determine their source, scientists need to find more of them, especially ones that repeat, which could provide reliable observations.